I like to read everything. Well, almost everything. But if it's a good book, no matter, the genre, I will give it a try. I don't like to write reviews, I just like to read. 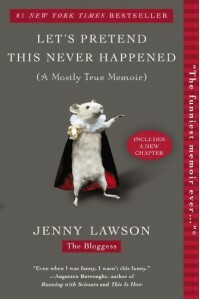 I have been a follower of Jenny's blog for the last few years, enough to have already have read some of the things she discusses in the book. However, it was interesting to read about her growing up years, and some of the health issues and challenges she has. i don't know how well it would be received if you didn't know how quirky she really is before you read the book, but I enjoyed it.